"Reboot" - Upcoming latest Hacker Movie you should watch ! 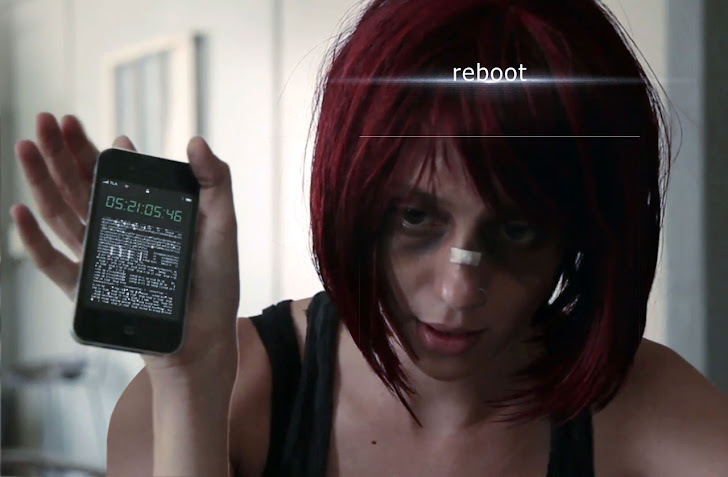 Rosa Entertainment and Jan-Ken-Po Pictures just announced that their cyberpunk thriller short film “Reboot” will launch with a Sneak Preview at DEFCON. Written and Directed by Joe Kawasaki, and Produced by Sidney Sherman, the film stars a bevy of hot up-and-coming actors including Emily Somers (Gabriele Muccino’s upcoming “Playing the Field”), Travis Aaron Wade (“War of the Worlds”), Martin Copping (Australian series “Neighbours”), Sonalii Castillo (“NCIS”), and Janna Bossier (Slipnot’s “Vermilion"). Set within a dystopian world that is a collision between technology and humanity, “Reboot” touches upon many of the current social and political concerns that arise from becoming more and more intertwined with the virtual. In contemporary Los Angeles, a young female hacker (Stat) awakens from unconsciousness to find an iPhone glued to her hand and a mysterious countdown ticking away on the display. Suffering from head trauma and with little recollection of who she is or what is happening, Stat races against time to figure out what the code means and what unknown event the pending zero-hour will bring. The recent launch of their ARG (Alternate Reality Game) has caught the attention of hackers and cyberpunk fans via Twitter. Basically, some Easter Eggs are hidden in the film trailer for viewers to find. When a player thinks they have found anything, they simply send a direct message to @reboot_film on Twitter for confirmation. As players find things they are awarded points and the Top Ten players will be awarded some cool prizes. For more ARG details, please go to: www.rebootfilm.com/scoreboard. To view the trailer: www.rebootfilm.com/trailer. The film is the product of a successful Kickstarter campaign and has been building momentum ever since it was first announced on kickstarter.com in August of last year. Kawasaki said, "It (the film) was originally designed to simply be a great little ride, but as real world events keep developing around us (regarding issues of cyber-freedom, online privacy, security, etc. ); the connotation of the film evolves and changes with it." "Reboot" is a co-production of Sherman's production shingle, Rosa Entertainment, and Kawasaki’s Jan-Ken-Po Pictures; and the filmmakers are aiming for international film festivals like Cannes, Locarno and Toronto, as well as distribution via the internet.